I think I’m officially 1995 compliant now, with a Newsletter signup widget and a Contact Form. Go me! I do plan to put out a newsletter now and again, as it’s the best way to get in touch with people. Social media is falling flat and charging you for the privilege. I’m not going to ditch facebook or twitter (and I hardly use twitter), but I’d like to make my website more of a community space for [U-D-R] fans. I’m not going to set up forums again or anything, facebook can handle that as far as I’m concerned. But I do want to create an environment where I’m feeling more connected to my fans, rather than having them be faceless entities in the facebook miasma. 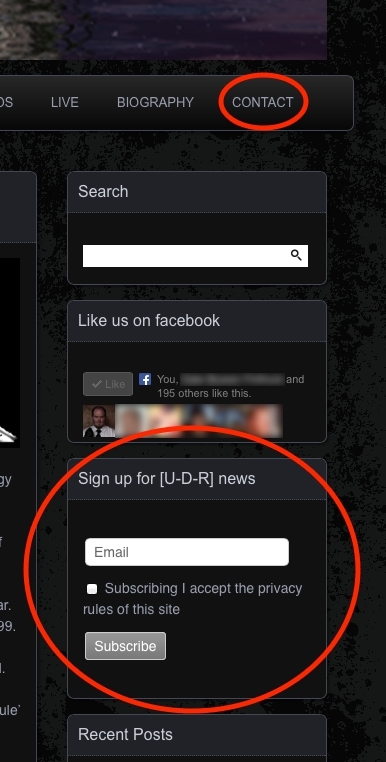 You can find the newsletter signup in the right sidebar on any page. The new contact form can be accessed from the menubar.